Doughnuts donuts doughnuts donuts doughnuts donuts. The debate rages on. But no matter what you call them, these Krispy Kreme-inspired treats are the best I've made. And owning a deep fryer made them the easiest batch I've ever made, too! My apartment only kind of smelled like a Tim Hortons, and they were done and fried within minutes with minimal clean up. An easy-to-make doughnut? I'm as scared as you are. But there's no reason to fear these-- they're fried and fabulous. 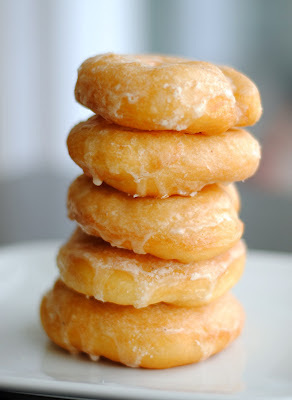 I adapted this recipe from my old one for glazed and sugar-coated donuts. The updated recipe should be easier to follow, but still includes measurements by weight, which I definitely find the most accurate and simplest way to bake. If you don't have one already, please pick up a scale! It's one of the best kitchen investments you can make. Trust. Want to chat about doughnuts or yell at me for spelling it wrong? You can find me on Facebook and Twitter! In a large mixing bowl, combine the flour, the rest of the sugar, and salt. Cut in the butter using your fingers or a pastry blender, until it resembles crumbs. Add the beaten egg and yeast mixture to the flour mix, and blend into a smooth dough. Turn the dough out onto a lightly-floured counter and knead for about 10 minutes—it should feel springy and little bubbles should form under the surface. Place it back in the bowl, cover with a cloth or plastic wrap, and let rise for about an hour until double in size. Once risen, place the dough onto the counter and stretch into a long rectangle (about 14 in by 4 inches). Cut strips about an inch wide, and shape them into circles (much like you would a bagel). Cover the doughnuts with a cloth while you heat the oil to 375F. In a medium mixing bowl, whisk together all the ingredients until smooth. Take the warm donuts and dip them one at a time into the glaze. Place on a wire rack with parchment underneath.